STERLING, Va. – Fans and players of the internationally popular game of cricket can enjoy it year-round, at the 20,000 square foot building in an industrial park that’s been transformed into the Wicket Club. “Cricket is a religion in India,” says Shaista Chaudhry, who recently opened the club with her husband, Nasr. The bat-and-ball game, the national sport of England, bears similarities to baseball and is popular in much of the world. Wicket Club has a series of mesh screens, which allows the spacious warehouse to be configured for an indoor match, or sectioned into three lanes for bowling and batting practice, similar to a baseball batting cage. 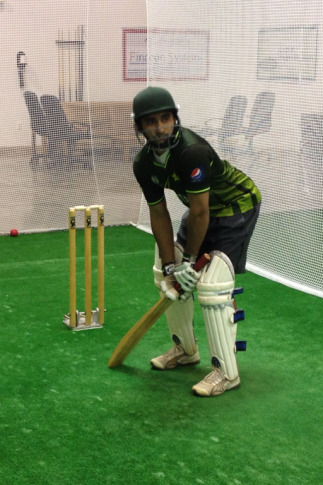 Player Ahmer Qureschi says proper equipment is needed. “These are leg pads, because when the bowler bowls at you, they’re allowed to hit you. And the helmet is also important, because the way the ball bounces you don’t know where it will bounce and sometimes they will purposely bounce it to make it hit your face,” Qureschi says. “The outside is leather. It’s stitched together, really tight. The inside is cork. It’s kind of like a baseball but harder. It actually hurts much more than a baseball,” he said. Open less than two months, the Chaudhrys say the club will be forming leagues, including cricketers from young to seniors.